So you got some really nice bread, like “pain de campagne” or something similar and you are looking for a hearty dish to dip it in? 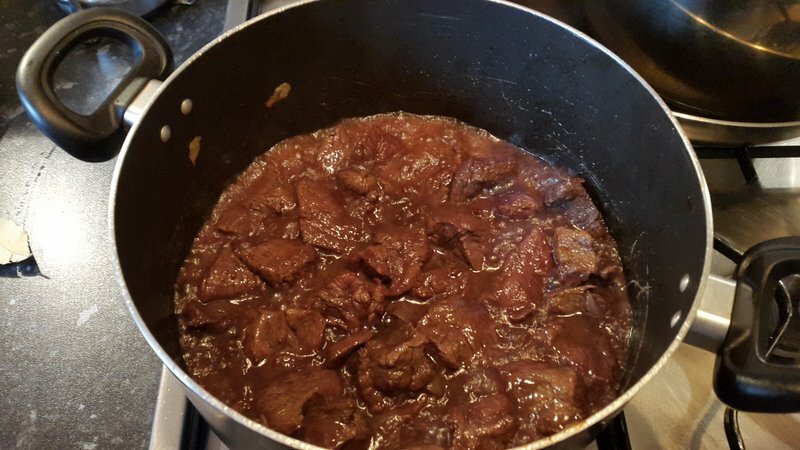 For all you meat lovers, I made a beef stew that will melt in your mouth. 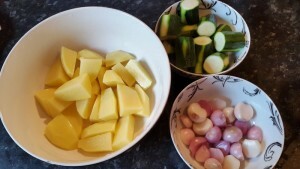 To make it more like a complete dish, I added courgettes and potatoes so you can pretend that you had your “5-a-day”. But we know it’s more than that, don’t we? Ingredients (feeds 4 people or 2 hungry horses). 2-3 potatoes cut in big pieces. 3 big and juicy tomatoes. 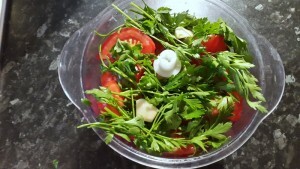 A bunch of flat-leaf parsley. I start by preparing the vegetables: cut the potatoes in thick pieces, chop the onion in small pieces (not too small), cut the courgettes in thick slices. Of course, keep the potatoes in a bowl of water until you use them. Prepare the tomato sauce: Chop the tomatoes in thick pieces, throw them into the blender together with the garlic and the parsley. Don’t overdo it with the blender, we are not making a tomato soup! Cut the meat in big-ish chunks. In medium heat, pour a little more than a tea cup of olive oil and start frying the onion until it softens. 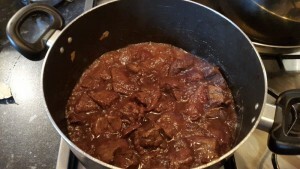 Add the meat and cook it until it gets brown. Add salt and pepper to taste. When ready, pour the wine and leave it for a few minutes for the alcohol to evaporate. Your kitchen should start smelling like a pub on a Friday evening. You may start drinking the remaining of the wine. Not the whole bottle, you need to be able to return to the kitchen later when the stew is ready. Add the tomato sauce from the blender. 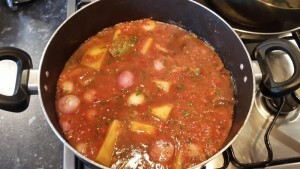 I always add some tomato purée dissolved in a cup of hot water to enhance the tomato flavour. 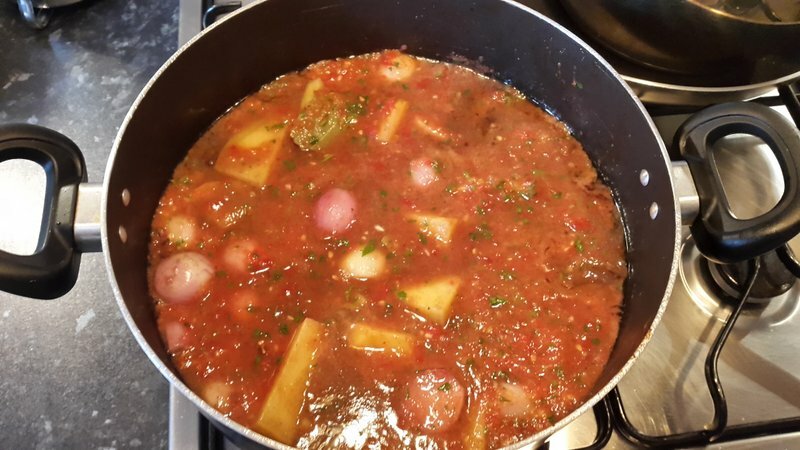 Of course, if you are lucky and you are in a country where the tomatoes are sweet, juicy and full of aroma, you may not need to do it. Add the potatoes and shallots, some paprika (around a tea spoon), lower the heat to minimum and let the beast slow-cook for ~ 2 hours. The juices must cover all the ingredients. If not, add some hot water. Courgettes need less cooking than potatoes, so I add them 45 minutes after I added the tomatoes. 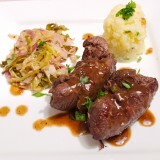 When it’s ready, you should be able to easily pierce the potatoes with a fork and the beef chunks are almost melting. 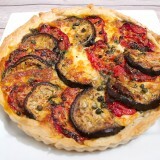 Serve it with nice bread, Feta cheese and a nice Bordeaux or Montepulciano d’Abruzzo. A big THANK YOU to Kon for her help and inspiration to prepare the recipe.